It has been more than three decades since Luyeva Yangali saw her father, Fortunato, for the last time. But, although she was 11 when it happened, she remembers with clarity the day he disappeared. 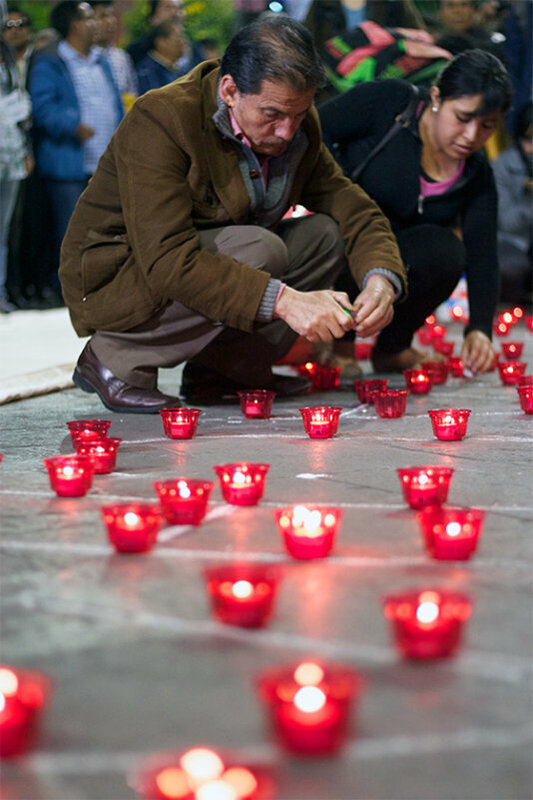 Tomorrow is the International day of the Disappeared – time to remember. On 21st December 1983 some policemen arrive at Luyeva Yangali’s home in the village of Churcampa, in the Peruvian Andes, to lure her father by demanding he is required for a meeting. Fortunato Yangali worked in the Churcampa municipality, located in a region ravaged by the internal conflict confronting the leftist guerrillas against the Army, and was the father of four children. He and two of his brothers went with the policemen, but as they didn’t come back their family asked for them in the police station. Police told them they knew nothing about it. For years, the attorney didn’t accept Fortunato's missing report. Just in 2003 Luyeva was able to denounce it formally. It was after the Alberto Fujimori dictatorship (1990-2000), when the Peruvian government created the Human Rights Specialized Prosecutor’s Offices Ahmed to the crimes committed from 1980 to 2000 by guerrillas and public security forces. Nevertheless, 12 years have passed and nobody has been prosecuted for the disappearance. “The legal process is stuck because of the lack of evidence, as every policeman in Churcampa says he doesn’t remember anything,” Luyeva tells. She hasn’t yet found her father and uncle's corpses. “Some Churcampa neighbors have told me where they may be and I told it to the attorney. But he answered me that it was very expensive to take people there for the exhumation, that I have to be sure about the place,” she explains. Luyeva wants to go there and dig them out herself, but the attorney has forbidden it. Just like her, thousands of other Peruvian families are still looking for missing relatives 25 years after the end of the conflict. However, the State hasn’t ever taken this task seriously. The Truth and Reconciliation Commission, established after the fall of Fujimori, presented its final report on August 28th, 2003. It made some recommendations for reparation, among them, the creation of a National Searching Plan for the disappeared. But after 12 years of that, missing people relatives are still waiting for such a plan and they censured the fail to make a systematic search for their loved ones, the disorganization in this matter and the lack of resources for it. That’s why several NGOs and relatives' associations have launched on occasion of the anniversary and to the International Day of the Disappeared a campaign to press the government to raise an already drafted Law for the search of Missing People to the Parliament to be debated. The first thing families asked for this law is an official list of people disappeared during the armed conflict. There are several of them, but no one is complete. According to a report presented by Peruvian public prosecutor to the Organization of American States in 2012, they were 15,371. Besides, there are many disappearances not reported by the relatives. They fear retaliation, they don’t have money to go to a city to report it or they just don’t know how or where do it, as violence focused in the most alienated and distant regions in the country, in poor peasant who generally can’t even speak Spanish. Among the 15,371 missing people, only 2,064 bodies have been recovered, explains Miluska Rojas, from the NGO Citizen’s Movement to Prevent it Happening Again, but not all of them have been returned to their families, as many of them haven’t yet been identified. This is due to the “lack of a gene bank with the missing people DNA”, explain the activist. “The prosecutor office isn’t taking genetic samples to every family with a missing relative”. This way, sometimes it exhumed a burial site after a denounce from a relative and find many bodies. Authorities don’t look for their families, and the human remains “are kept in a prosecutor office’s store, in bags”. Another aims of this law, remarks Miluska, are to get the psychological support for the families and the massive research of near 4,500 burial sites identified so far. It should allocate too a budget for the DNA identification. Nowadays, when a body is exhumed, “the family must wait four or even up to six years to get a DNA test and to know for sure if he or she is their relative”. 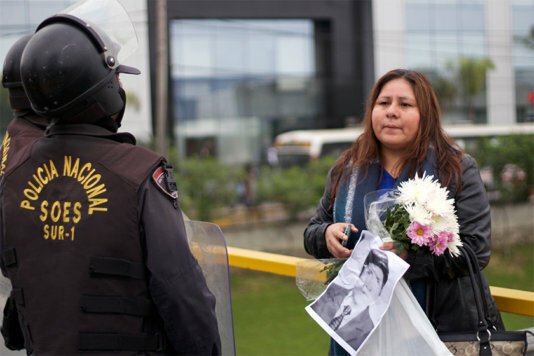 The relatives of public security forces’ victims are not the only ones who are neglected by the Peruvian government. There are also those who search for someone who has been disappeared by the guerrillas struggle and then abandoned by the State - even if the missing one is a soldier or a policeman. Then, the authorities look for them for only the three legally stipulated years. 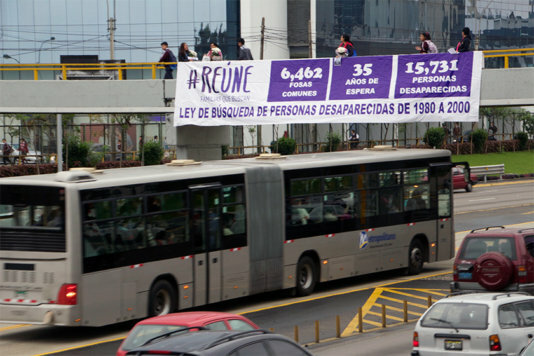 “The authorities’ response in our country is completely null, deficient, very frustrating”, claims Julio César Jerí, whose 15-years-old son, César Raphael, disappeared on 9th April 1992, in the city of Huancayo. His family got to know later that he had been extorted before by the guerrilla Túpac Amaru Revolutionary Movement, so they are considered the most plausible responsible, indicates his father, who has been looking for him since then. “I reported it in the police station, in the prosecutor office, in the Parliament Human Rights Commission, to the Army… but more than 20 years have passed by and I haven’t got any effective, clarifying answer that give me at least some relief with regard to what happened to my son”, he complains. “I think the Law for the Search for Missing People is going to be a useful tool as it is aimed specifically to the find the disappeared ones,” he assess. The government of the current Peruvian president, Ollanta Humala, agreed the guidelines for this law in 2012 with relatives' associations and it took two years to draft it. But in spite of having it ready since last December it is still yet to be sent to parliament. Luyeva_Yangali, daughter of the disappeared Fortunato Yangali, will not give up. 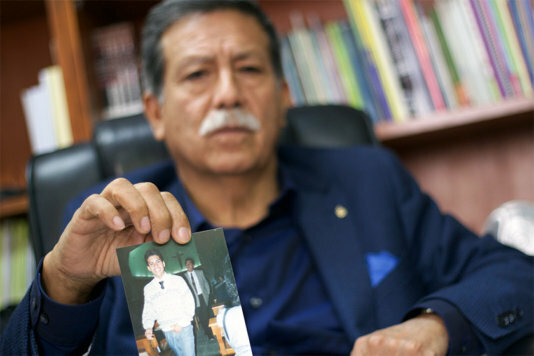 Julio César Jerí showing a photo of his disappeared son César Raphael Jerí.